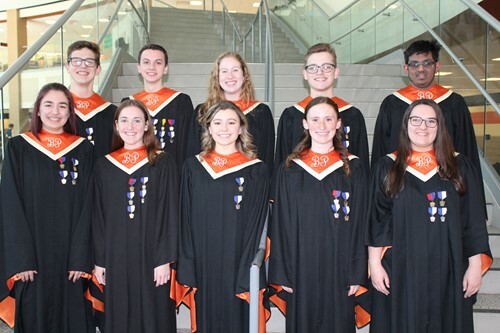 Ten Bethel Park High School vocalists successfully auditioned and have been selected to perform in the Pennsylvania Music Educators Association’s All-State Chorus, which will be held during the April 3-7 PMEA State Conference at the David Lawrence Convention Center in Pittsburgh. Representing Bethel Park in this event will be seniors Abby Kauric (Soprano 2), Anthony Lucchitti (Tenor 2), Katelyn Marcovecchio (Alto 1), Cameron Sillman (Tenor 1) Julianne Stein (Alto 1) and Jerry Varghese (Tenor 1). Also participating from Bethel Park are juniors Jessica Abraham (Soprano 1), Molly Hoffman (Soprano 1), Kelsey Rogers (Soprano 2) and sophomore Collin McCormick (Bass 2). The students are taught by Bethel Park High School Choral Director Todd Kuczawa.